Hi, everyone. Eveliina, thank you very much for giving me the floor for a couple of minutes. I’m sorry about using some notes to read in this moment, but time is short, my memory is faulty, I’m still kind of bad at improvised public speaking, and I wouldn’t forgive myself of I forget some of the ideas that I want to share with you now, before this amazing week is over. On Wednesday I talked to Eveliina and proposed her a deal. I asked her to take the floor today for at least five minutes, and told her that I would bribe her with a bright, big box of yummy Swiss chocolates for every additional minute she could give me to talk. As she finally allowed me to speak during TEN minutes, that means she will have, by the end of this talk, full home-stock of chocolates for Christmas and winter season. I definitely had a productive night yesterday so now I’m sure that she will become chocolate-rich today! Thank you again for this, Eveliina. I owe you one. Some among you wouldn’t believe me what I say, but actually I feel way more comfortable listening than speaking. I am a listener by nature. In comparison, I find speaking much less necessary, especially as you grow older and you become more aware of all the important stories that other colleagues have for you to tell. And let me insist in that I wasn’t meant to make any statement in the official program of this training; I wrote this small text between Wednesday and today morning (I finished it at 5:47 AM, Swiss timezone, just a few hours ago; fresh stuff then; the bread is still hot at the bakery, no time for proofreading); and I wrote it because you inspired me to do it. Simply, my sense of responsibility – and also my sense of gratitude – compelled me to say a few words at the closure of this event, a few words about what has happened to us throughout this week. This is the first time of my life that I’m taking the floor in a building of the United Nations, and as it might be the last time too, so I’d better do it well. And after the super hard simulation we just had, as the atmosphere perhaps got a bit tense, we really need to turn that page in the best of ways, so we can make an adequate assessment for our lives of what has happened here. As we only have but five fingers in every hand, I want to divide my words into five, very brief finger-points. This will make things easier for me to tell, easier for you to retain and, who knows – one can always dream – it may even inspire the UN about the power of simplicity, so you decide perhaps to adjust your narrative about the Sustainable Development Goals (remember the presentation we had on Tuesday), to adjust it before their big meeting in September 2015, if not to reduce the the goals from 17 to a smaller number, at least to group the existing 17 goals into four or five categories or topics, which would be easier to retain and comprehend by every single citizen and policy-maker in the world. A delegation of Colombian students inspiring the discussion about the post-2015 UN development agenda? Well… why not… let’s hope so. My five finger-points are as simple as this: one ‘congratulations’, and four ‘thanks’. And let’s start first with my congratulations. Naturally, my congratulations go to you, to all the Colombian students who were part of this event. Bravo! You decided to invest a huge amount of your time in coming here and you made a big budgetary effort to do so. This way you showed commitment in the development of your professional careers and you showed there is no doubt about how much you want to contribute to the sustainable development and prosperity of our country. And what is more, you have engaged with this training in a good, constructive attitude. Proof of this is the respect you have showed to one another, to our speakers and to all the UNCTAD staff. Proof is also the quantity and quality of your questions and comments in every session of this event, and the rich reflexions you produced in the simulation activity you made today. Again, bravo! Naturally, then, my first ‘thanks’ also goes to you guys. You give me a lot of inspiration and you make me believe in a brighter future for our country. It’s nice to join a visit to the Geneva organizations of such a bunch of brilliant fellow nationals. Our constant conversations and your constant positive attitude renew my motivation to keep working harder and harder for the future of our society. Thus I’m very grateful with you. Not less important than this, my second and third ‘thanks’ go to two persons that have been crucial for this event to be such a success. All of you know of who I’m talking about. The work of coordination made by Maria Alejandra, from the Colombian team, and by Eveliina, from the UNCTAD team, has been outstanding and we all have benefited from it. I don’t know how many of you have organized conferences and this kind of events. I’ve done it a few of times and I can tell it is a terribly difficult thing to do. It takes so much time; it involves a lot of initiative; and it is a kind of ‘invisible’ work that is never rewarded enough. Hey ladies, what a great job you have done for us. You both deserve our highest appreciation. We must thank you a thousand times. I beg to all of you guys to join me with a big, big applause for them! 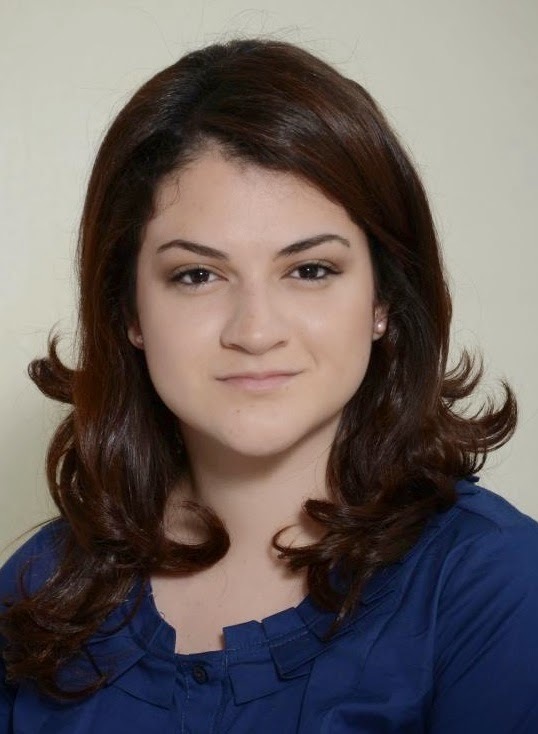 Maria Alejandra, I particularly acknowledge that you have helped the group to achieve a good level of self-organization, and your efforts to make us follow the protocols we needed for the event to be successful. Some of you might think Maria Alejandra is a bit strict with us; she indeed has a ‘though-mom’ mode and is always ready to argue with us when we’re not following the rules. I know sometimes this is not easy to digest, but what is good to see is that there is no rule she proposes without cleverness and rationality behind it. That’s why you Aleja deserve all our shoulder-to-shoulder support on this issue. Look at the simple rule of sitting in the same place during the whole conference: that helps all of us to remember our faces and associate them with the comments and questions we make during the presentations, while we get to know each other better. Or look at the rule of being punctual in the mornings. That has guaranteed we’ve been able talk and to do some networking with one another while we wait for the presentations to start. That’s why I thank you so much for the work you were doing with us; and I was very glad to see that the more things were working well, like on Wednesday at the WTO, the more relaxed you were behaving, showing us more and more the super-great ‘nice-mom’ mode of yours. You care for us and that’s so good to see. Personally speaking, I also thank you Aleja because it was YOU who had the initiative to invite me to join this training once again. It’s true that now I’ll have one more week of delay in submitting my doctoral thesis next year, but this is a good price to pay as you saved me during these days from the monotony of reading minutes of the WTO meetings, allowing me to have so much fun with all of you here. That is totally fair trade! Thank you. Now let me turn to Eveliina. Not only she helped us organize the awesome agenda we had throughout the week but she has also given us daily support, professionalism, always a smile and the best of attitudes. But please let me be emphatic in this: When you guys take the plane back to Colombia, during your flight I beg you to think a lot on Eveliina, and to try to remember not only all what she made for us during this week. Please, try to remember also ALL THE THINGS SHE NEVER DID. What I mean is: think about her discretion and professionalism in the conduction of her work; think about the room and time she always gave to the speakers, never competing against them for protagonism; and think about the interest and attention that her face and gestures were reflecting not only when she was taking notes during the presentations, but also in every single moment of the week. All of you already know that I’m writing a PhD thesis about multilateral diplomacy in Geneva, and some know that part of my thesis consisted in making a big ethnography, conducting dozens of interviews to diplomats and officials of the UN and the WTO. The fieldwork I made allows me to say that there is a sort of “Geneva ethos” of excellence and professionalism in this city. AND my fieldwork allows me to say that there is no better incarnation of this ‘Geneva ethos’ than OUR Eveliina. In fact, at the end of the day – and, please, at the end of your flight back to Bogota – I’m totally sure that we will learn from Evelina AS MUCH as what we have learned from each one of our speakers of this week. Eveliina, from my hearth, thank you very much for all the support you gave us this week. You are more than a model to follow. Finally, as last point of my words – and I beg for your patience here, because I really need to make this last point a little bit longer –, on behalf of the Colombian delegation, I want to say ‘thanks’ to UNCTAD as institution for the wonderful GIFT you have given us by bringing this week-long training to our country, instead of choosing someone else. And I know well that many countries in the world are imploring you to enjoy this privilege as well, and I know that you work with very limited resources. First, I thank you UNCTAD because of what is obvious. I think that in the world there is no better concentrated, espresso-like introduction to the universe of International Geneva (la Genève Internationale) than the amazing training you have given us this week. Wow! It has been just as exciting as it has been unbelievable. What a privilege we had! I strongly believe that it is almost impossible – almost – to come to this training and not to grow up both as a professional AND as a person. You’re helping us to compare ourselves at higher standards and therefore to reframe our goals so to improve our individual competences. You’re smart, UNCTAD: you know well that by training us to become better professionals, at the same time you’re helping Colombia as a whole to achieve economic development. I imagine you’ve noticed that some of us in the delegation are ‘old-school’ now: Estella had come to the training before; and Catalina, Nico, Andrés and I – and maybe someone else – were here last year. Let us think the four of us on this: how much have we grown up, as professionals and as persons during the past twelve months! Our change has been big and has been for the better. And if UNCTAD hasn’t been the only ‘influencer’ of that change of ours, it’s 100% sure that YOU have been an important part of it. Vous avez été des complices. So I would dare to say that there is an “UNCTAD effect” in people. And I believe that in this year’s training the UNCTAD effect has hit us stronger. Don’t you think, Nico? Don’t you think, Andrés, Cata? Let me enumerate what you’ve done for us, UNCTAD: you made us visit the key IOs in the city, AND you brought us outstanding speakers from your house AND, particularly, you brought us here three of our diplomats who represent us in this city. We saw how great they are. We all can tell that they are not only among the finest leaders of our country, but – and I can tell this with certainty – they are among the finest diplomats in the world (Andrés number two, what a privilege you have in working as intern here with them!). Often at home we ignore the competence of our envoys here, so for us Colombians attending their speeches is a great thing to see. It’s the best illustration of all the human potential we have as a society. We know at home that Colombia, our country, is famous for being ‘the country of passion’; and it is true. We are full of passion. Passion is never missing in our equation and that is a good thing to have. But that is not enough. The true is that when we give the best of our potential IS WHEN we let that the ‘Colombian professionalism’ finds its way to join the Colombian passion! We have ‘passion’ ‘made in Colombia’. But more and more we need to produce professionalism ‘Colombia made’ as well, to join and to add to our wonderful passion. Moreover, our ambassadors not only showed us what we are capable of when we study hard and when we work hard, but they have also taught us VERY WELL what we can call ‘the spirit of multilateralism’. Let me quote the words of Ambassador Quintana on Monday. When he was explaining the engagement of Colombian foreign policy in the multilateral system, he said: be present; participate; add value with your statements in such a way that when the group is discussing about certain issue, people want to turn their backs to look at you because they want to take your opinion into account. Nothing else, but nothing more. I don’t know a better and more beautiful explanation about the spirit of multilateralism that that one by ambassador Quintana. It’s not about dictating to others what you know; it’s not about forcing others to do the things your way, it’s not about struggling for power. It’s as simple as being present, and making your participation constructive so that the rest is willing to take them into account. No less, no more. We all should learn from this spirit and we should apply it more and more back in our country. We need more of this spirit in our universities, in our government, in our companies, and even in our homes. One of you guys asked me yesterday after the ambassador’s talk, “hey, tell me, how do you achieve that people don’t forget you, Juan?” Oh God, that is a tricky topic! My first reaction is “Oh boy, you are entering into dark waters. You’d better stop there!” What can I say? Questions that flatter our egos are very dangerous to answer, because we all have an ego, and I believe we need to contain this ego as if it were a rabid dog! What is more: this guy here in front of you is not any rockstar. To be sure: lots of people forget me, and lots of people dislike me and I’m totally unable to do anything about it. But let me tell you this: if there’s really something special in what I did during this training when interacting with you guys – warning, I’m still not sure about that and I don’t really wanna believe it – that especial “something” is nothing different that my deliberate will to apply the spirit of multilateralism that I’m learning in Geneva thanks to my doctoral thesis into my life. So let me insist, this spirit is very simple: one, try to add value to the teams you make part of, two, don’t talk much, rather be concrete and try to never monopolize conversations, three, don’t force people to think or act your way, and four, respect EVERYONE because every single person has feelings and has an ego to take care of, just like you and me. Do nothing less; do nothing more. I know this doesn’t work all the time, and no matter how smart we are, we are never as intuitive as we need to be in every context. But this ‘multilateral spirit’ does help a lot. As long as we are ready to really pay some attention to Geneva and to its peoples, that is the simple lesson that this city is ready to teach us all. And, yes, let me be optimistic: I believe this UNCTAD training is helping all of us to MOVE more and more toward that direction. I definitely hope so! Colombia is a country that suffers from two huge fractures. We should not hide them; we must make them visible. We need to identify them well because otherwise we will never overcome them. The fracture number one is our geographical fracture. Colombia is a big country even if we tend to forget it. I come from Antioquia, which is just a chunk of the national territory; and I don’t know if you recall that Antioquia alone is bigger than Switzerland. Moreover, Colombia is full of mountain ranges that divide our territory and we lack the transport infrastructure that could help us connect our regions better, the way a mountainous country such as Switzerland does it. Thus we Colombians don’t know each other well and often have more emotional ties with the region and city where we live than with the country as a whole. To prove it let me give you this example: we Paisas maybe can feel that San Andrés or Amazonas belong to us because they are Colombian territory. But, do we also feel that we BELONG to San Andrés or to Amazonas? No, we Paisas tend to believe that we belong to Antioquia only. Again: you Bogotanos might feel that Chocó or Nariño belongs to you as it is part of the country. But what about the other way around? Do you also BELONG to those territories? Do you feel that you also belong, let’s say, to Quibdó? Do you also wanna ‘spend’ energies and and time – and love – in your life for the sake of the peoples of those territories? About two years ago I was having lunch with Paula Moreno. I’m sure you remember who she is; she is a former minister of culture and she was the first Afro-Colombian woman to become member of the government cabinet in all our history, and, surprise, I’m not mentioning her randomly, it turns out she lived in the city of Geneva for a while, so she benefitted from Geneva a little bit the same way we are doing it! Paula Moreno’s appointment as minister was of course part of the ‘Obama effect’ in our country, this renewed and so much needed ‘black empowerment’ (and there are still skeptics who believe that no positive things come to Colombia from the U.S.!). Anyway, having lunch with Paula in Bogotá near la Plaza de Toros, she was laughing at me when I was telling her that me being a Paisa it was difficult to feel myself a Colombian… but it is true! It takes us a while, often years, to REALLY broaden our sense of belonging. It takes us traveling, meeting people, abandoning unfair and absurd prejudices… and it takes us coming to UNCTAD! Indeed, here we have people from Cali, Medellín and Bogota. By joining this training together and meshing the way we are doing it, we are overcoming our traditionally excessive regionalisms, we are building bridges and making a new, more integrated Colombia. Thank you UNCTAD for that. The fracture number two is – and I promise I’m about to end – the fracture number two is our social fracture. Being Colombia one of the top countries in the world in terms of economic inequality, it is no surprise that it suffers from huge, heavy, painful social discrimination. Our social atmosphere can be so heavy at times that we often forget that life IS LESS about status and competition and more about cooperation. And historical roots of discrimination are so old and practices are so embedded in our society that, to some extent, we can say that no one is guilty of this discrimination, nor even the ones that discriminate you. Discrimination is just so embedded that you barely notice it in your everyday interactions. It’s like fish. Fish only live under the water, so they might never know that water exists. They just don’t see it because they don’t have any other point of reference. That’s why going abroad for a while is so useful for us Colombians in order to gain perspective and to see the country how it really is. Andrés can tell from his experience in Berlin; Andrés number two from his experience in Geneva; Sara can tell from hers in Lausanne; Eddy from hers in Singapore; and so on and so forth. Why am I saying this? Discrimination is terrible for everyone that suffers from it, and, moreover, discrimination is tremendously expensive for our societies. It costs us money because it prevent us from being more effective when working in teams. And as discrimination happens in every sphere of the Colombian society, it also happens within universities. It happens between students and between professors. And discrimination also happens between universities (you know it guys; I’m not lying here; we all know it). So one additional good thing about this UNCTAD training is that even if the universities present in this delegation are all private (sadly there is no representation of public ones) they are very diverse indeed. Here we have delegations from the capital as well as from the province. We have delegations from historically well-established universities, and we also have from younger ones that are doing things well and that are working hard to build a good reputation. We have delegations from universities with big as well as with modest budgets. So, UNCTAD, you bring us here, you help us know each other better, and you help discover that there are lots of talented people, NO MATTER the social background where we come from. Sara Arroyo, please allow me to use your case, because you are an excellent example of what I’m talking about here, (and Maria Alejandra, because of the small conversation we had on Tuesday, I know you are following me 100% in this comment). Some of us here have African descent, which is natural in a country in which about one out of every five people is black. But you, Sara, perhaps you are the most Afro-Colombian member of our delegation. It’s so great to see how much Colombia is advancing in terms of social inclusion. Not only have you been an equal here, but we all have enjoyed and learned from your brilliance and from the quality of the comments and questions you have asked. When I see YOU being the way you are, and when I see the spontaneous acceptance that everybody has showed for you, I say to myself, “hey, that is the Colombia where I want to live in.” And let me tell you this: do you remember the presentation by Ambassador Gabriel Duque Mildenberg yesterday? I took ten pages of notes from his presentation the way I always do it but, funny enough, what touched me the most was at the same time the simplest part of his presentation, when he was explaining the golden rule of the WTO. Funny, because you and I have studied trade for years, and well, I’m writing a thesis about the WTO so I should know it well, right? But what was striking to me was the simplicity of Ambassador Duque’s formulation of the golden rule: “Tú no me discriminas, yo no te discrimino”; “you don’t discriminate me, I don’t discriminate you.” Wow. What a simple and yet perfect formulation! Don’t you think guys that we Colombians should ‘steal’ this beautiful golden rule out of the WTO, and use it as the slogan of the new, more inclusive society that we’re struggling to forge in our country? Oh, yes, I think we must steal that rule today! Now, guys, the rest is up to us. As a final thing to say, let me recall you guys that we are in a cinema now. As Kalman and the other speakers we had on Monday morning were telling us, we have been lucky enough to be hosted in the cinema of Palais des Nations for our UNCTAD training. In order that words match circumstances, let me quote… a movie. Do you remember V for Vendetta, that wonderful movie made by Andy and Lana Wachowski in 2005? “Remember, remember, the 5th of November.” I’m sure most of you have enjoyed that movie as much as me. Well, in a crucial scene of that film, the masked hero “V” tells to the so-far fragile (but subsequently brave) heroine Evey Hammond: “Evey, seize this moment”. Hey, that is exactly the same thing we should do at this closure of the UNCTAD training. This has been a week of important revelations to us, about who we are, about where we come from, about what we are capable of, and about HOW we want to be (I’m thinking here about the professionalism of the UNCTAD staff and of the three Colombian diplomats we had the pleasure to hear, plus the brilliance of all our speakers). So, guys, let’s seize this moment of important revelations, and let’s take the best of it for our careers and for our lives. “Remember, remember… 21st of November…” Remember today. Las grandes consecuencias de la crisis económica y financiera de 2008 y 2009 pusieron de manifiesto los peligros de un sistema financiero global, puesto que el rápido contagio de las economías más desarrolladas debilitó los indicadores económicos y los mercados en todo el mundo. Este proceso, conocido con la globalización financiera, generando una desconfianza generalizada hacia la existente arquitectura de las finanzas. Sin embargo, la posibilidad de limitar las transacciones comerciales y las relaciones económicas entre países tiende a ser cada vez menos contemplada; debido a los inminentes beneficios que un sistema financiero con estas características puede traer. Replantear los principios y no la manera en la que son aplicados puede convertirse en un peligro en contra del desarrollo de la sociedad. Durante los últimos años, especialmente después de las reformas de liberalización económica tomadas durante la década de los ochenta, el sector financiero mundial ha sufrido un proceso de globalización. Este proceso busca promover movimientos de capitales que garanticen la distribución eficiente de los recursos, en una escala global. En este sentido, se dice que un sistema financiero con estas características tiende a ser más competitivo, transparente y eficiente que uno cerrado (Tovar García, 2012). Sin embargo, las consecuencias de este fenómeno han sido especialmente fuertes durante las crisis económicas; se dice que aquellos países con un sistema financiero mejor desarrollado tienden a ser afectados más adversamente que los países cuyo grado de integración al sistema financiero global es menor (Lartey & Farka, 2011). Sin embargo, por otro lado, la literatura ha encontrado conexiones entre el desarrollo financiero y el crecimiento económico y el desarrollo social. Así, un mayor desarrollo financiero, entendido como el aumento en el volumen de servicios financieros tanto de instituciones financieras bancarias, como no bancarias y de las transacciones financieras de los mercados de capital, puede aumentar los niveles de crecimiento económico, debido a la facilitación de la inversión y a la mayor productividad en la distribución de capitales (Pradhan et al., 2013). De manera consecuente, estas dinámicas económicas contribuyen a la reducción de las desigualdades, la pobreza y la desnutrición (Culpeper, 2012); el crecimiento económico promueve la distribución del bienestar material (Pradhan et al., 2013). Por esta razón, a pesar de las posibles consecuencias que tienen la globalización y el desarrollo financiero, obstaculizar los principios de comercio abierto y de un sistema financiero global, sería ignorar los inminentes beneficios que trae para el desarrollo la estabilidad del sistema económico y financiero (especialmente para los países en vías de desarrollo). El impacto de la globalización financiera sobre el desarrollo económico será positivo si los países promueven un sistema financiero desarrollado y bien regulado (Tovar García, 2012). Con la crisis económica, se ha demostrado la importancia de las instituciones de crédito y manejo del riesgo para el crecimiento económico y, sobre todo, de las instituciones reguladoras del funcionamiento del sector financiero (Gauri & Qureshi, 2013). En esta línea de pensamiento, se proponen estrategias que busquen regular las transacciones financieras, a favor del desarrollo, e integrar estas dinámicas de manera eficiente en los demás sectores de la economía, de manera que el sector financiero pueda responder a diferentes necesidades del desarrollo tales como planes de industrialización en los diferentes países (Culpeper, 2012). Finalmente, es preciso para los países, especialmente, aquéllos en vías de desarrollo, promover relaciones financieras libres, incluyentes e igualmente, reguladas. El desarrollo financiero sigue siendo un principio para las economías de hoy; cambiar la manera en que se ha operado será el reto de los diferentes países que deseen obtener sus beneficios. Culpeper, R. (2012). Financial Sector Policy and Development in the Wake of the Global Crisis: the role of national development banks. Third World Quarterly,33(3), 383-403. Gauri, F. N., & Qureshi, R. (2013). Financial Crisis and the Developing Countries. Transnational Corporations Review, 5(1), 4-11. Pradhan, R. P., Mukhopadhyay, B., Gunashekar, A., Samadhan, B., & Pandey, S. (2013). Financial development, social development, and economic growth: the causal nexus in Asia. DECISION, 40(1-2), 69-83. 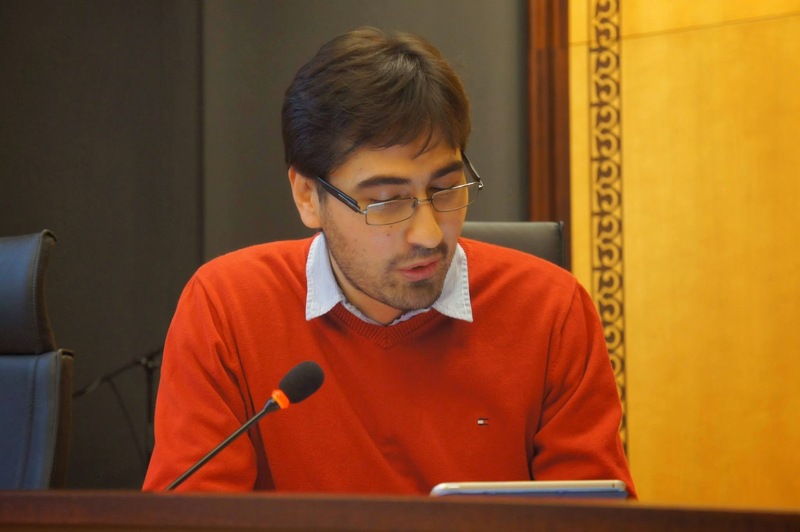 Tovar García, E. D. (2012). Financial globalization and financial development in Latin America. Revista Cuadernos de Economía. Multinational Corporations (MNCs) are the drivers of globalization and internationalization. MNCs have substantially contributed to the world trade and development as has been identified by multilateral financial institutions such as IMF, World Bank, World Trade Organization and UNCTAD, to name a few. Latin American Region is home to emerging economies and is deeply integrated in the world trade. The paper presents an overview of Multinational corporations (MNCs) in Latin America. Globalization in simple words stands for free flow of goods, services, people and ideas. Globalization started with the voyage of Christopher Columbus in 1492 and was later on followed by Vasco da Gama in 1497. Since then, artificial entities have treaded the path and have settled offshore for capturing the markets. One cannot deny the contribution of small trading firms and small investors in world trade and investment but it is the multinational corporations (MNCs) that are responsible for a lion’s share of world trade and investment. MNCs are such artificial entities having a common seal and perpetual existence. An MNC is an enterprise that owns and controls production or service facilities outside the country in which it is based. (United Nations, 1973). East India Company of England may be treated as the progenitor of modern day establishment of MNCs. Over the past century MNCs have boosted and contributed to the world trade substantially. Latin America comprises of South America, Central America and the Caribbean. Overall it is a conglomeration of more than 20 economies characterized by the presence of emerging economies to which MNCs are attracted due to presence of untouched markets and untapped resources. Thus, it becomes imperative to develop an overview of MNCs in Latin American economic region. 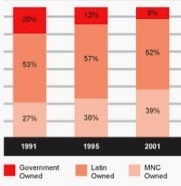 · Privatization of State owned Industries: During the period 1991-2000, the MNC share increased by 13%. E.g. the Spanish MNC Repsol became one of the world’s biggest oil firms after purchasing Argentina’s state owned YPF to form Repsol YPF in 2002 (Martinez & Ivan, 2003). · MNC led industry transformations: An example of the same is expansion of Wal-Mart (The Retail Giant of US) starting from Mexico and spreading towards south (Martinez & Ivan, 2003). The objective of this research paper is to present an overview of MNCs in Latin American Economic Region. The study is based on the limited data available on the official and international institutions websites. Reference to academic research papers is limited due to access to limited academic databases. MNCs code of conduct with special reference to Latin American economic region has not been dealt in detail. MNCs are increasingly discussed in the international business circles both academic and professional but hardly a consensus is found on the definition of MNCs. Even the theoretical framework presents a number of different theories for understanding MNCs structure such as Chandler MNC structure (1962), International Division Structure, Area Division Structure, Product Division Structure, Global Matrix Structure. In addition to this, different organizational models have been propounded to understand MNCs such as Multinational Organizational Model, International Organizational Model, Global Organizational Model and Transnational Organizational Model. Restricting the discussion within the objective of the study, it is imperative to mention key definitions of MNCs. MNC is a business enterprise maintaining direct investment outside home country (the country to which it originally belongs or where its head office is based) and that has value added holdings in more than one country (Spero & Hart, 2003; Dunning, 2008). MNCs may also be treated as privately owned institutions that organize, through various means, interdependencies between individuals in more than one geographical territory (Hennart, 2008). Not only this, MNCs are economic organizations growing from its domestic origins and spreading across borders (Kogut & Zander, 2003). With respect to benefits of MNCs, it has been observed that MNCs increase investment, income, employment; transfer technology and contributes to inventions and innovations (Heidenreich, 2012). Regarding strategic objectives of MNCs, global efficiency, flexibility and organizational learning have been identified (Bartlett & Ghoshal, 1992). It has been clearly identified that capital flow is not the distinguishing characteristic of MNC (Hymer, 1976). MNCs are the product of foreign direct investment that is defined as the effective control of operations in a country by foreign owners. From a sociological point of view, MNC is the mechanism by which organizational practices are transferred and replicated from one country to another (Kogut, 2003). Cuervo-Cazurra (2010) coined the term of Multilatinas referring to the companies coming from American countries possessing value added operations outside the places of origin. Casanova and Fraser (2009) has previously highlighted that Multilatinas have taken advantage of their domestic positions in order to expand their operations through Latin America. In addition to this, according to Cuervo-Cazurra (2007a), Multilatinas is the phenomenon of liberalization of eighties and nineties that forced Multinational enterprises to improve and progress on their levels of competitiveness so as to bear the challenges of internationalization. Multilatinas have smaller size, less technology and less sophisticated resources in contrast to developed country MNCs giving an edge to Multilatinas in domestic operations. Multilatinas enjoy the ability to manage difficult situations due to their challenging experiences at regional level. Rivera and Soto (2010) define Multilatinas as MNCs originating in Latin America that own and control access abroad through FDI and develop adding value activities. Other factors responsible for the internationalization process of Multilatinas are the population distribution, the education levels and Free Trade Agreements at intra-regional level. Gonzalez-Perez (2010) highlights that the competitive advantages of Multilatinas will allow them to broaden its internationalization process. Santiso (2008) stresses the role of Brazilian and Mexican enterprises in the appearance of new multinational corporations in the emerging markets of Latin America and Multilatinas came up due to the push and pull factors along with fall in the cost of capital in the region. 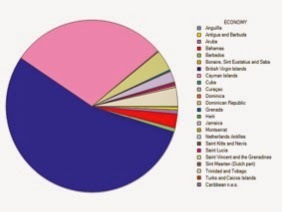 · Large numbers of MNCs shift their profits to a tax haven country and then from there they invest in other home countries. MNCs at times hide their actual profits through transfer pricing technique in order to evade taxes. · Due to the spread of R&D facilities among subsidiaries, the home country may remain deprived of such facilities. · MNCs enjoy economies of scale due to large production. This makes them sell goods at lower prices. When selling in domestic market, it becomes a threat to the domestic firms of the home country. · The home government can prohibit any investment or technical collaboration with a particular host country. E.g. the US Government had not allowed the transfer of the latest computer technology to East European countries during 1980s. · The home government can design fiscal and monetary disincentives to deter any outflow of investment. Discriminatory tax and exchange control mechanisms may be used. E.g. during the US Balance of payments crisis of late 1950’s, the government has restricted the outflow of its currency for overseas investment. · The home government may tighten rules and regulations relating to approval of outward FDI. E.g. during 1970s and 1980s, foreign joint ventures and capital investment were allowed under restrictive policy in India. · MNCs take advantage of resources available in the host country but are not concerned with the environment or sustainability. MNCs on this count argue that they are utilizing the unused resources, catering to the demand of the local population and giving employment to the locals. · Domestic firms try to isolate MNCs by political initiatives. The reason being that in view of the low price of MNCs, domestic firms cannot market the goods. · Government monitor MNCs in view of MNCs gaining a monopolistic position that may become threat to the host government. · The host country government insists on appointing government representatives on the management board and on manning the senior positions with the local personnel who are expected to work in the interest of the host country. · The host country government insists on the domestic participation in the equity share capital. The profits are distributed among the local shareholders minimizing the outflow of scarce foreign exchange. · The host country government issues guidelines to the MNCs to purchase inputs from the domestic sources. In cases, subsidies may be given as incentive to purchase inputs from the domestic sources. · The host country government puts in restrictive clauses in the import rules and encourages strict surveillance in order to check unwarranted activities. Another important area related to MNCs is their code of conduct that has been a subject of much disagreement between developed and developing nations. For qualifying as an MNC the number of countries where the firm operates must be at least six (Vernon, 1971; United Nations, 1978). At the same time, the firm must generate a sizeable proportion of its revenue from the foreign operation, although no exact percentage is agreed upon. This entirely means that the firm should be big enough to have its stronghold in many countries through branches and subsidiaries. MNCs stronghold in the host countries is evident from the fact that in 2002, 57.5 percent of the total sales, 48.1 percent of the total assets and 49.1 percent of the total employment in top 100 MNCs were accounted for by the host countries (United Nations, 2004). On the basis of strategic features, MNCs are grouped as ethnocentric, polycentric and geocentric (Perlmutter, 1969; Perlmutter & Heenan, 1974). Ethnocentric MNCs are those that adopt home-market oriented policy and seldom distinguish between the domestic operation and the global operation policies. On the other hand, polycentric MNCs operate in the foreign country just to cater to the demand in those countries. They follow a host-market oriented policy. The geocentric MNCs maintain a balance between the home-market and host-market oriented policies. Punnett and Ricks (1997) differentiates between a multi-domestic company and MNC. According to them, the former is concerned more with the market of the host country where it operates; the latter is concerned with the global market. Bartlett and Ghoshal (1989) differentiate between a MNC and a transnational company. In the former, decision making is normally decentralized and the activities of the firm are not strongly coordinated. In the latter, the global business activities of the firm are perfectly configured, coordinated and controlled so as to achieve global competitiveness. The review of existing literature shows growing involvement of MNCs in Latin American economic region. Last thirty years have witnessed the development of global strategies by MNCs dramatically (Adler, 1997; Bartlett & Ghoshal, 1998). The present global integrated world has accepted MNCs as the main players of global knowledge based economy in transforming the current global business environment. MNCs are obliged to operate in different national contexts (Heidenreich, 2012). The phenomenon of the rise of multilatinas is a consequence of the process of economic liberalization in Latin America in the period of 1980s and 1990s (Cuervo-Cazurra, 2007). For MNCs important factors influencing efficiency includes productivity, economies of scale, learning curve effects and a company cost culture (Adler, 1997). MNCs over a period of time have paid emphasis on these key issues and have gained substantially. MNCs have a flexible approach that means ability to explore opportunities and manage risks arising on part of diversity and volatility in global business environment (Bartlett & Ghoshal, 2000). Due to MNCs cross country presence, knowledge and competencies have transferred to foreign markets from home country (Mabey & Salaman, 1995). It has been observed in the past literature that same has happened to the Latin American Region. MNCs competitive moves are integrated across nations (Albrecht, 2001). MNCs have gradually matured enough and to compete efficiency they have achieved global advantages by remaining globally competitive in due course (Shah & Yusaff, 2012). MNCs in Latin American continent have fostered and profited from Latin America’s vast market potential (Martinez & Ivan, 2003). After 2001, the ownership of 500 largest companies in Latin America changed with Non-Latin multinational ownership growing to 39% from 27 %. In 2000, there were 166 merger and acquisition (M & A) deals initiated by MNCs for a total value of $102.6 billion (Martinez & Ivan, 2003). The trend has continued since then due to unmatched competence of MNCs. Regarding future of MNCs, their fate depends on the response of economies as governments are rethinking about globalization and open door policy after the 2008 World economic Crises (KPMG, 2012). MNCs expand their businesses through FDI mode that has been identified as a competitive way in comparison to exporting for operating in international markets as it generates the highest profit levels ( Lu and Beamish, 2000; Tang and Yu, 1990). According to Eiteman, 2004 a joint venture is usually the best option when a company wants to get immediate understanding of the market and wants to enter the market through a less capital intensive approach. Latin American Region has witnessed steep rise in joint ventures initiated by MNCs. In the long run, MNCs can generate value in Latin acquisitions in two ways: by increasing productivity and by capturing synergies (Martinez & Ivan, 2003). An analysis of table 3 clearly indicates that the growth rate has declined in the Caribbean economic region eventually, though it has shown a correction increment from 2010 to 2011. With respect to Central America, in year 2011 the growth rate has been negative which is alarming but has been corrected by a positive growth rate of 5.83 % in 2012. In regard to South America, eventually it has decreased to 5.58 % from year 2009 but has again gained few points to reach to 7.73% in 2012.It is to be noted that South America has failed to achieve the golden rate of 2010 in the succeeding years ending in 2012. An analysis of table 4 makes it crystal clear that South America has outperformed Caribbean and Central America in terms of the compounded annual growth rate. South America shows a CAGR of 19.19 % while Caribbean shows 18.86%. 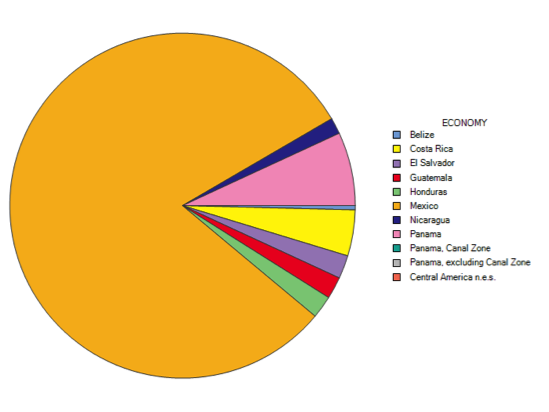 Central America has showed the least CAGR that is 8.75%. This shows the superiority of South America in the compounded growth of FDI inflows. This leads us to the point that overall in the last few years the economic environment has not been favorable for multinational corporations in Latin America. The obvious reason may be the global economic crisis and the slowdown witnessed in the aftermath. This signal needs to be properly read out by the policymakers for Latin America in case the aim is to attract Multinational corporations (MNCs) in general and Foreign Direct Investment (FDI) in particular. In the end it would be deemed fit to summarize the study. The study has highlighted the growing importance of MNCs in Latin American economic region by presenting the data related to FDI Inflows. As 75% of the FDI in the world is through MNCs, the presence of MNCs is felt all over Latin America. Several emerging economies in Latin American economic region has attracted huge foreign direct investment (FDI) by MNCs and thus envisage the future potential of Latin America. 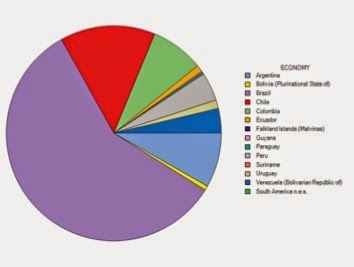 Therefore, the academic contribution of the paper is an overview of MNCs in Latin America particularly the activities of MNCs related to investing in the Latin American Economic region. The paper also highlights areas that needs to be studied further in order to search for causality in opposition to correlation so as to have insights for future decision making. It would be interesting to see what pattern is followed in the coming years with the presence of world’s most innovating MNCs in Latin American economic region who would be facing competition by the home MNCs: the mutilatinas of Latin America. Further research is required for analyzing the mergers and acquisitions (M & A’s) by MNCs in Latin American economic region. Adler, N.J. (1997). International Dimension of organizational behavior, 3rd edition. Cincinnati, South West College Publishing. Albrecht, M.H. (2001). International HRM: Managing Diversity in the Workplace, UK, TJ International Ltd.
Bartlett, C.A. & S. Ghosal (1989). Managing Across Borders: The Transnational Solution, Boston: Harvard Business School Press. Bartlett, C., and Ghoshal, S. (1998). Managing across Borders: The Transnational Solution, 2nd edition. London: Random House. Bartlett, C.A., Ghoshal, S. (2000). Transnational Management: Text, Cases and Readings in Cross-Border Management, 3rd edition, Boston: Irwin McGraw Hill. Bartlett, ., and Ghoshal, S. (1992). Transnational management. Homewood, IL: Irwin. Boatright, J.R. (1993). Ethics in the conduct of Business. Englewood Cliffs: Prentice-Hall. Casanova, L., & Fraser, M. (2009). From Multilatinas to Global Latinas. The Latin American Multinationals (Compilation Case Studies). Inter-American Development Bank Working Paper. Washington, DC: IBD. Cuervo-Cazurra, A. (2008). The multinationalization of developing country MNEs: The case of Multilatinas. Journal of International Management, 14(2), 138-54. Cuervo-Cazurra, A. (2010). Multilatinas. (Spanish). Multilatinas. (English), 25, 14-33. Gonzalez-Perez, M. A. (2010, July 7). Multilatinas, mucho que aprender. Dinero.com. Retrieved from http://www.dinero.com/opinion/opinion-on-line/articulo/multilatinas-mucho-aprender/98924. Hennart, J.F. (2008). The Future of Multinational Enterprise‟,” Netherland, Academy of Management Annual Meetings. Hymer, S. (1976). The international operations of national Firms: A study of direct investment. Ph.D. thesis, Massachusetts Institute of Technology. John, R., Gillies, G.L., Cox, H., Grimwade, N. (1997). Global Business Strategy, London, International Thomson Business Press. Kogut, B., & Zander, U. (2003). A Memoir and Reflection: Knowledge and an Evolutionary Theory of the Multinational Firm 10 years later, Journal of International Business Studies, pp.505-515. Mabey, C., & Salaman, G. (1995). Strategic Human Resource Management, Oxford, Blackwell Publishers Ltd.
Martinez, Alonso., Souza, Ivan De., & Liu, Francis. (2003). Multinationals Latin America’s Great Race, Strategy+Business, Booz & Company, Issue 32, Retrieved from http://www.strategy-business.com/article/03307?pg=all. Perlmutter, H.V. (1969). The Tortuous Revolution of the Multinational Corporation. Columbia Journal of World Business, IV, Jan.-Feb.,9-18. Perlmutter, H.V. & Heenan, D.A. (1974). How Multinational Should your top manager be, Harvard Business Review, LII, Nov.-Dec., 121-132. Punnett, B.J. & Ricks, D.A. (1997), International Business, Oxford: Blackwell Business. Santiso, J. (2008). La emergencia de las Multilatinas. Revista de la CEPAL, 95, 7-30. Shah, Fayaz Ali., Yusaff, R.M., Hussain, Altaf., & Hussain, Jawad. (2012). IOSR Journal of Business Managemant, Volume 3, Issue 5, pp 28-37. Spero, J., & Hart, J. (2003).` The Politics of International Economic Relations, London, Thompson Wadsworth. Vernon, R. (1971). Sovereignty at Bay: The multinational Spread of United States Enterprises, New York; Basic Books. Vernon, R. & Wells, Jr. L.T. (1986). Manager in the International Economy. Englewood Cliffs: Prentice-Hall.